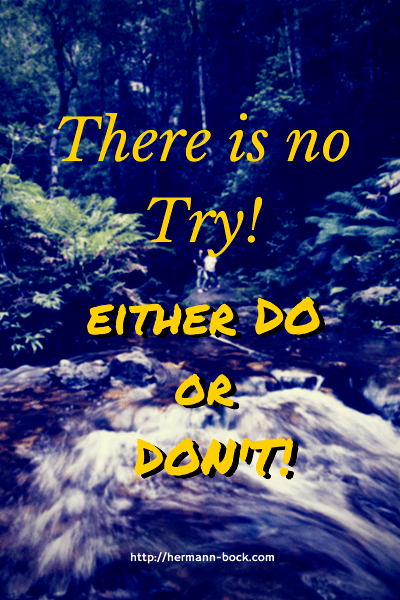 » Don’t just try; DO! How to get rid of the inability to ACT! We all have been confronted with a situation where we intellectually knew what was best for us and yet, it was very hard to actually do what was required of us to properly benefit from it. The reason things like this happen to us, is due to the fact that, very seldom, we do stuff because our intellect consciously tells us to do it. The truth is, that there are many things that determine how we act and why we do what we do. It’s however a fact, that most of what we end up doing, is controlled by our subconscious. Think about it, people do stuff because they are “used to doing it that way”, or because “it feels good”, or “it’s part of my temperament”, or “it’s a habit for me”, etc. If you examine these claims to a deeper level, you’ll discover that they are “ALL” controlled by that part of us that we tend to forget, but that rules our lives 24/7, namely, our subconscious mind. This is why, whenever you say that you are going to try to do something, you will most likely not do it. Or, if you start, as soon as the going gets tough, you’ll stop. Probably telling yourself proudly, Hey, at least I tried! One thing we forget most of the time though, is how fast our brain or mind acts. When you’re being presented with a course of action, your brain starts immediately evaluating how painful or pleasurable will it be to follow that course. If the result of the evaluation is, VERY PAINFUL, you’ll most likely completely avoid doing it, at whatever cost. However, if the result is just painful, you might offer a: I’LL TRY! The thing is though, that your subconscious mind already knows that it won’t like the process, that it will cause it discomfort and pain and it doesn’t want to commit. But your conscious mind, your intellect, which is aware of the possible social repercussions of not following that course of action, compromises. And forces you to say those awful words I’LL TRY TO DO IT! Now that you know what happens behind the scenes in your mind, when you’re confronted with an unpleasant task, you can take countermeasures. It’s not going to be easy, given that we tend to go through life like robots. We have so many habits and routines or, like Tony Robbins calls them, RITUALS that have been installed by who knows who, that we just keep repeating in an automatic fashion. That’s why we react the same way, most of the time. You come back from work and, most likely, do exactly the same everyday. Hang the keys, take your shoes off, head for the fridge to get something to drink and so on and on and on. And that is also why, when we get to the point of interrupting a pattern in an abrupt manner, we have the possibility of installing a new one. What I’m trying to achieve, is to make you stop and think about the things you do, and the reactions you exhibit to the different things that occur in your life. Deactivate the Autopilot and take the manual control of your reactions. Don’t ever again say, I’ll try! Instead, say either I WILL! or I WON’T! Remember, your mind already made an evaluation (though not necessarily a correct one) of the situation. So, if you don’t like it at all, say I won’t do it. It’s so simple! But what if it’s something unpleasant and arduous that requires lots of time, money and effort, but is to your own benefit? We all have been in that situation. We want something but it’s hard to get and could even take years to achieve. Time during which we will have to spend money and put in lots of effort. What can we do? Think about school. Most of us went through it for years. We had to, day in and day out, attend those boring classes and we were not even sure WHY we had to. How come the majority of us finish at least basic school? We had somebody pushing us and holding us accountable. Be it your parents or even the government. It’s something you just have to do in modern society. But have you been able to achieve something as monumental as that, by yourself? If you have, it’s because you tapped into the powers of both, your conscious and subconscious minds. They helped you become accountable and keep the goal in front of your eyes as real as possible, so you didn’t detour and kept going in the right direction. You made a commitment to DO IT, and you did it. But how did you manage? You committed, you held yourself accountable and you kept your goal in front of you as real as possible! That’s the key to doing it and not just trying it. As I mentioned above, each one of us has habits or rituals that we do, even unconsciously. The problem is that most of those rituals were not installed by us with a specific result in mind. But, we definitely CAN do that! Imagine creating routines that help you achieve your goals, by keeping them in front of you as much as possible. Are you going to write a blog post every single day? Create a ritual that helps you achieve that! Do you want to change your way of eating? Maybe reducing the amount of sugar and starches that you eat? Engineer a ritual that will help you in not even buying the stuff in the first place! These rituals are the results of CHOICES and DECISIONS that you make at some point. Then you take the time to develop a series of steps or behaviors that will help you get what you want. And then, you repeat those steps until they become automatic. You create a ritual! So, what you gonna do? The ball is now on your side of the pitch. It’s your decision if you’re going to do something with this or, if it’s just going to be like one of those thousands of memes going viral on the Internet on sites like Facebook, Google+, Twitter or Pinterest. Try to take just one lesson from this and make the choice to implement it as fast as possible. By having a little success, you’ll feel motivated to keep it up. Make it a ritual to improve yourself a little bit each day. Believe me, it’s worth it!